Today’s precise and affordable IoT solutions enable asset tracking and monitoring across the globe. SenseIT IoT by Domain can help your business streamline data collection and analysis, achieve greater operational efficiency, reduce costs, and improve customer and vendor relationships. Domain Consulting Group, an SAP partner, helps small and mid-sized businesses reduce their technology costs and achieve faster time-to-value with systems that can be implemented quickly, are uncomplicated to maintain, and minimize end-user training. The Internet of Things, also known as IoT, refers to the billions of physical devices around the globe that are now connected to the internet, collecting and sharing data. In general, the term is used for devices that would not ordinarily be expected to have an internet connection. Due to the availability of inexpensive sensors, affordable connectivity, scalable cloud platforms, and the vast processing and storage capabilities of big data platforms, the IoT offers innovative solutions for supply chain operations, with processes and applications never thought possible. IoT devices and systems are helping manufacturers identify components that are likely to fail so they can be swapped out before causing damage. They are helping fleet managers track, monitor and improve fleet utilization. And now, they are making global shipment tracking and monitoring more accurate and reliable than ever before. 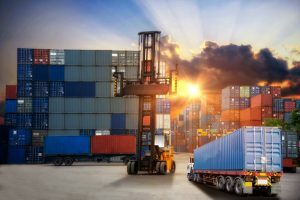 Whether your business is involved in temperature-controlled transportation of pharmaceuticals, vaccines, biotechnology, food, sensitive tropical plants or other commodities, or products that can be damaged in transit by deviations from handling protocols, the real-time visibility, tracking capabilities and condition monitoring of your shipments and assets can be invaluable. SenseIT IoT by Domain utilizes innovative sensors to track your shipments from end-to-end, capturing data from around the world and enabling you to quickly locate items globally and alerting you instantly to condition changes. With SAP Business One, companies can manage their entire shipping and fulfillment process more efficiently from the same ERP system they use for everything else. The best-in-class ERP software offers an affordable, powerful way to manage your entire business, from sales and supply chain management to financials and operations. When powered by SAP HANA, everything can be done faster, using less computing power. SAP HANA is an in-memory relational database management system and application platform that allows for the lightning fast processing of massive amounts of real-time data and generates interactive reports in seconds for faster decision-making. If your company is not on an SAP platform, SenseIT IoT can often be integrated with other ERP platforms, such as NetSuite. Learn more about integrating SenseIT IoT by Domain for asset tracking and monitoring. Contact Domain Consulting Group at (610) 374-7644 ext. 7005 for a free consultation.